This book melted my cynical little heart, you can’t help but love the beautiful, broken, earnest men that are Will and Jem. But Clare also made me cringe at the cliché romance, and roll my eyes at the sketchy plotting. I enjoyed this more than the first instalment, though the plot suffers badly from second-book-syndrome and can’t qualify as more than a YA romance with a light dusting of fantasy. 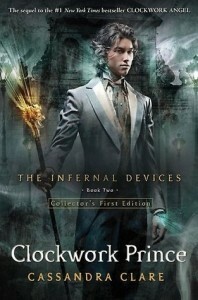 Clockwork Prince is the 2nd book in the Infernal Devices trilogy. If you haven’t read Clockwork Angel yet I recommend picking it up before you read the rest of this review, as it will contain spoilers for the first book. You have been warned. The plot of Clockwork Prince is difficult to summarise because so little happens in terms of story progression. The ‘Magister’ continues to elude capture, though he doesn’t seem to be trying particularly hard, there is some subterfuge and betrayal, that is rather neatly resolved, and of course, the love triangle that is Will, Tessa, and Jem becomes even more hopelessly tangled. Interestingly the Lightwood family, and the servant Sophie have the most character development, and I was glad to have some new perspectives and opinions to add layers to the rather one-dimensional ‘mystery’ that forms the main plot line. It’s hard to put my finger on anything that I loved about this book except Will and Jem, because the more scrutiny I put this story under the more it unravels. Will and Jem are both fascinating in different ways, and for all the clichés they embody I found them intriguing characters. It feels like Clare put far more thought and effort into developing tragic back stories and layered personalities for Tessa’s love interests than into the mystery the plot supposedly revolves around. I loved watching Jem really come to life in this book, stepping out from under Will’s shadow. Meanwhile Will was finally able to show his softer side, and move on from the rather repetitive petulant act. All of this kept me engaged and entertained throughout the 500 or so pages. When it comes to things I disliked about this novel I can’t get past the tediously boring central plot. There was virtually no progress made in the hunt for Mortemain. There were so many scenes that seemed to painfully contrived to advance the love stories, rather than progress the mystery, that I found myself wavering between desire to read the rest of the romance and desire to put the book down out of frustration with the lack of plot development. If you loved Clockwork Angel, and you love twisted love stories this is the series for you. If you are looking for a complex urban fantasy or a high fantasy with excellent world building I suggest you pick up Neverwhere by Neil Gaiman or A Darker Shade of Magic by V. E. Schwab. The Infernal Devices is a love story first and a fantasy novel second, which is not necessarily a bad thing, it’s just something that needs to be in the forefront of your mind when setting expectations.